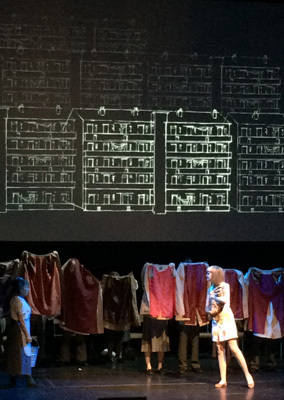 Our work with Cardboard Citizens continued throughout the Spring with a very special one- off re-staging of Ken Loach’s iconic TV play ‘Cathy Come Home’ at the Barbican on July 5th. We were Digital Designers on the project which involved us creating the storyboard, design, animation and presentation of Joanna Layla‘s elegant illustrations. The performance was streamed live and received a 4 star review on The Guardian‘s website. The production was commissioned by the Institute of Fundraising on the 50th anniversary of the TV plays initial airing and in the year of Cardboard Citizens 25th anniversary. You can watch the performance HERE which is followed by a panel discussion chaired by BBC journalist Samira Ahmed featuring Ken Loach.